Welcome to another installment of If My Book, the Monkeybicycle feature in which authors shed light on their recently released books by comparing them to weird things. 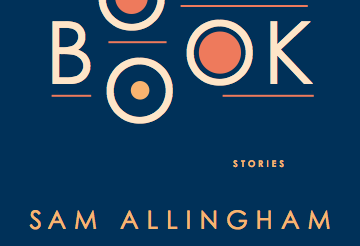 This week Sam Allingham writes about The Great American Songbook, his debut story collection just published by A Strange Object. 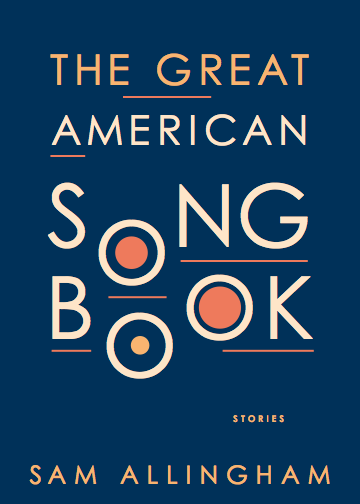 If The Great American Songbook were a musical key, it would be A minor. Not D minor, which Nigel Tufnel called “the saddest of all keys,” or B flat, the key you might expect, because there are so many trumpeters and clarinetists in these stories, but A minor, because it’s the minor side of C major, the shiniest, most familiar key, the one for lullabies. I wanted these stories to begin in a major key, as if they might be bright and simple, and to shade the minor in as they went along: a woman realizing the man she’s become obsessed with is just a more sinister repeat of her earlier abusive relationship; a daughter realizing her mother’s fixation on hunting is causing her to lose her mind. If The Great American Songbook were a kind of folk song, it would be a murder ballad: one of the ones that seems soft, at first, like “Banks of the Ohio”: “I asked my love to take a walk / just a little walk…” Everything starts so sweetly, with only the barest hint of danger. If The Great American Songbook were a piece of fruit, it would be a banana: versatile, delicious, packed with nutrients, but also fundamentally very weird, both in terms of shape and the extraneous peel that’s left behind when you eat it, bedeviling the heels of passersby. If The Great American Songbook were a part of the orchestra, it would be the string section. Not just because one of the stories features a cello-playing assassin, or because another one mentions Shostakovich’s string quartet “Opus 110,” but because there are so many styles and moods contained within it. Let’s face it: the woodwinds are too mellow, even a little boring, and the brass is too singular and forceful (too brassy, if you will). It’s the strings that are the most flexible: they can play low and soft or they can scrape the ceiling; they can bounce you along on a rollicking rhythm or bow so slow that it sounds like two icebergs moaning together. 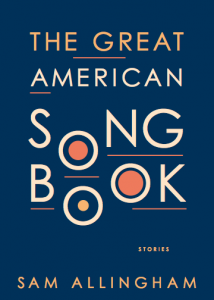 If The Great American Songbook were a time signature it would be ¾, a jazz waltz: a bit restrictive, as short stories always are, but within the waltz you can put the beat pretty much anywhere, and swing it where you like – like in “Stockholm Syndrome,” where you think the story is going to be about love, but it’s actually about delusion. If The Great American Songbook were a dance, it would be a two-step: from folk to country-western, two steps to one side, one step to the other. Sam Allingham grew up in rural New Jersey and Philadelphia. After graduating from Oberlin College, he worked for many years as a music teacher for adults and small(ish) children, before receiving an MFA from Temple University in 2013. His work has appeared in One Story, American Short Fiction, Epoch, n+1, The Millions, and Full Stop, among other publications. He currently lives in West Philadelphia and teaches at Temple University. Find out more at samallingham.com or follow him on Twitter at @samsamallingham.